Following the close conjunction of Jupiter and Venus on June 30, these planets will continue to share the evening sky throughout the month of July. They will also remain close to the bright star Regulus, in the constellation Leo. In a very rare and special circumstance, the cycles of Venus and Jupiter will coincide so that these planets will remain aligned as they descend into the sunset, each heading for their own conjunctions with the Sun. Usually Jupiter and Venus go in different directions after a conjunction, and it is very rare for them to continue to be aligned like this. Keep an eye on these bodies on the evenings of Saturday, July 18 and Sunday, July 19 as the waxing crescent Moon joins the scene. This will be the last evening conjunction of the season between the Moon and these planets. Morning conjunctions will begin in the fall, after the planets emerge again from the other side of the Sun. You will need a clear, flat horizon, free of trees and buildings, to see these planets as they draw closer and closer to the sunset. 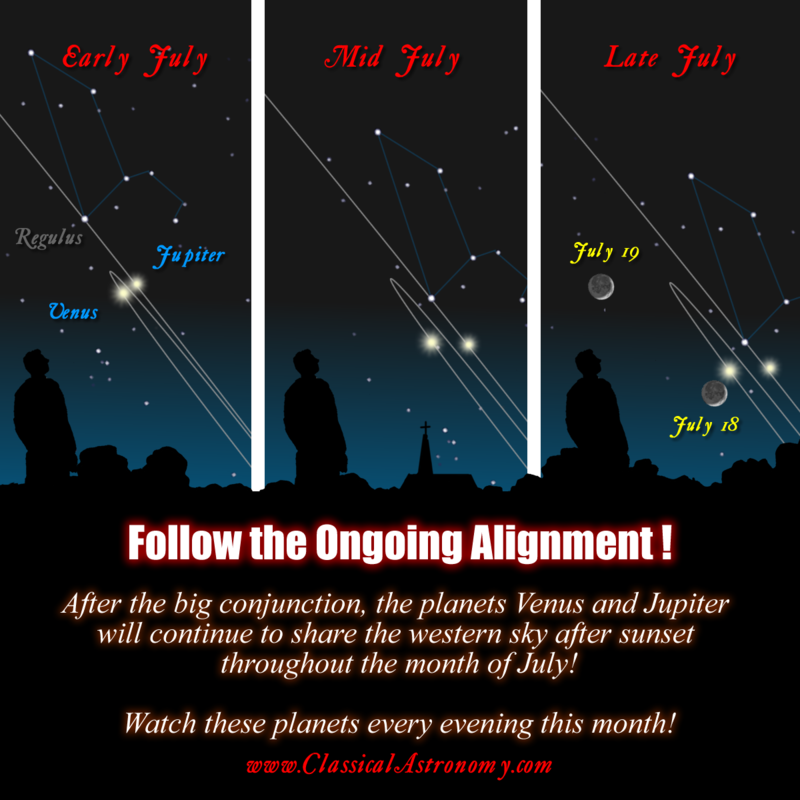 This rare ongoing alignment will not happen again anytime soon, so we hope you will follow it!